Turtles are strange organisms, and their development is wonderfully idiosyncratic. What other vertebrate alters its bone development to make an ossified mobile home? The turtle has perplexed biologists for many reasons. Where did turtles come from and to whom are they related? How did this different body plan arise developmentally and evolutionarily? The pieces of this puzzle are coming together with the help of technological advances that are revealing cryptic aspects about the development of these fascinating animals. One can often recognize different species of turtles by the shape and pigmentation of their scutes (“Scutum” being the Latin word for shield), or modified scales, that cover the turtle shell in a tessellation. Scutes are interesting developmentally because they grow radially to cover the entire shell, and this growth must be coordinated with that of the underlying bones of the shell (though, the patterns of scutes and bones are different). Evolutionarily, scutes are interesting because few groups of turtles vary in the number of scutes on the carapace (dorsal part of the shell), and certain freshwater and marine taxa have lost these structures altogether. Our Development paper ”The origin and loss of periodic patterning in the turtle shell” examines the development and variation (normal and abnormal) of turtle scute formation, integrating two areas of evolutionary developmental biology that are usually separated: The developmental origins of evolutionary novelty and the mechanisms of developmental constraints. To do this, we have combined several approaches, integrating techniques from developmental biology (in situ hybridization and organ culture), theoretical biology (computational modeling), evolutionary biology (comparative morphology and phylogeny), and physics (micro-computed tomography). Have we mentioned that turtles are seasonal breeders? Much progress has been made in the application of molecular genetic technologies to non-model organisms; however, the reproductive ecology of animals such as turtles can make the investigation of their developmental dynamics an odyssey. Though our laboratories are located in Helsinki (Finland) and Pennsylvania, our eggs come from turtle farms in Louisiana. In one season, we discovered that an array of patterned placodes generates the scutes of the shell. The following summer, we added drugs to the culture media to look at candidate developmental signaling pathways, and found that the placodal pattern requires Shh, Bmp, and Fgf signaling to form properly. We also acquired specimens of a turtle species that has lost its scutes, and found that these placodes are absent from that turtle. During the “off-season,” we developed computational models of scute formation, and hypothesized how both natural and abnormal variation is generated in turtle scutes. Finally, last summer, we tested hypotheses generated by the model with the addition of protein-soaked beads to our cultures. Such unbroken interlocking of shapes in a two-dimensional space is called tessellation, and one of the best-known artists whose work is linked to tessellation patterns is the Dutch graphic artist M. C. Escher. 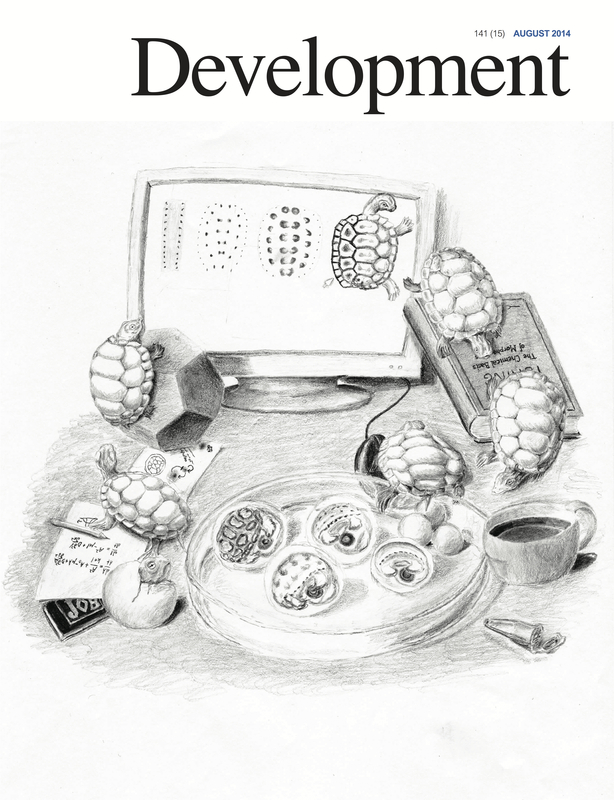 The illustration for the cover of the journal pays homage to Escher, and was done by Roland Zimm, the researcher who did the majority of the mathematical modeling in this article. Taking advantage of the geometrical parallels in his art, he re-drew a famous drawing of Escher’s, Reptiles in a modified way to depict key elements of our experiments. He gave himself the challenge of visualizing a unification of development in vivo and in silico, by integrating computational simulations within an idealized life circle of “real” turtles. A second homage is given to Alan Turing, who was a pioneer both in the fields of the foundations of computers and natural pattern formation. Turing’s reaction-diffusion mechanism is central to our hypothesis of scute patterning. This integration of computational modeling, experimental evo-devo, and classical art emphasizes the importance of cohesive interdisciplinarity in life sciences.